If you go down to the Scottish Storytelling Centre today, you’ll find Kate Leiper’s stunning new exhibition of artwork from An Illustrated Treasury of Scottish Mythical Creatures. 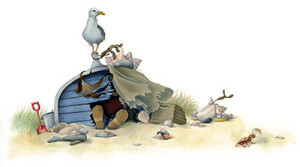 Kate’s exquisite work features selkies, giants, dragons and even the Loch Ness Monster, beautifully rendered in pastel to accompany Theresa Breslin’s magical retellings of Scottish folk tales. Specially invited guests battled through wind and rain to join Kate and Theresa for the launch of the exhibition on Friday evening. 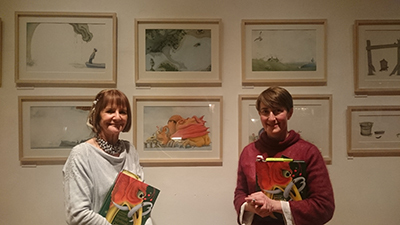 Theresa read extracts from some of her stories, while Kate presented her top tips for drawing a dragon! If your dragon is really big, drawing it next to something familiar helps the viewer see just how big! You can see the tiny sheep standing on the toe of the giant in Kate’s illustration from The Story of the Giant’s Causeway. Where does it live? Where does it hunt? Does it have to travel far from home to find food? Putting your dragon in a strong location will make it seem more real, like Gillon’s treasure cave from Gillon and the Selkie. 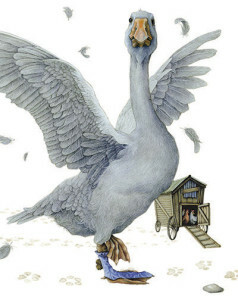 When Kate was drawing Griselda the Goose from The Saving Grace, she had a strong sense of what the character was like, and that helped bring the illustration to life on the page. You don’t need to show the viewer every little detail about your dragon. Sometimes it will seem bigger and fiercer if you only show a part. Like Kate’s version of the Loch Ness Monster. 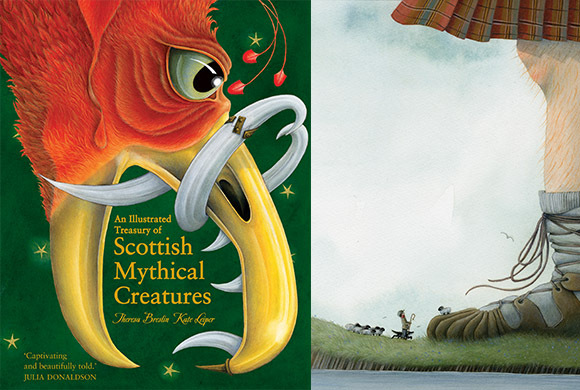 Kate’s exhibition, Sea Monsters, Selkies and Other Mythical Creatures, is on show at the Scottish Storytelling Centre until 9th January 2016. 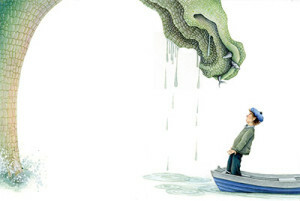 If the beautiful illustrations have inspired you to turn your hand to a bit of drawing, you might like to know more out our Kelpies Design & Illustration Prize. This is your chance to design a cover for one of our forthcoming Kelpies, and win a £250 cash prize! 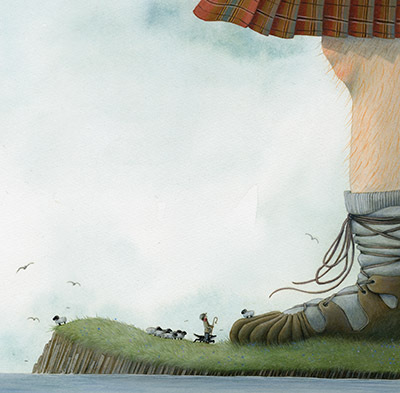 Visit our Kelpies Design & Illustration Prize page for more details.